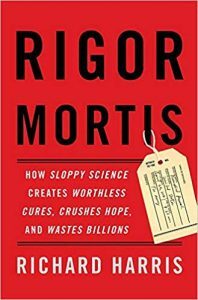 Rigor Mortis: How Sloppy Science Creates Worthless Cures, Crushes Hope, and Wastes Billions. By Richard Harris. New York: Basic Books. 2017. ISBN: 0465097901. 288 pp. Hardcover, $28. Richard Harris, a distinguished science journalist with National Public Radio, presents a deeply skeptical view of science in this journalistic but accurate depiction of the “other side” of science. The story opens: “Each year about a million biomedical studies are published in the scientific literature. And many of them are simply wrong.” Harris describes the experience of C. Glenn Begley, a scientist at biotech company Amgen, who discovered that much of the academic research his company relied on could not be replicated. In 2012, Begley published a highly cited commentary in Nature calling for better preclinical research. Other scientists began publishing similar results. In 2015, Leonard Freedman (of the Global Biological Standards Institute in Washington, D.C.) summarized estimates by other scientists that between 51 and 89 percent of studies were in some way unreproducible, at an estimated cost to the U.S. taxpayer and industry of about $28 billion per year. Harris tells of other scientists who came to similar conclusions.